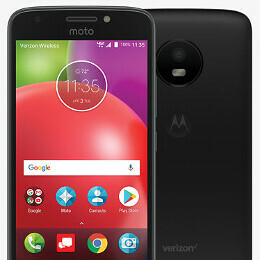 As of today, June 22, customers in the US can buy the brand new Motorola Moto E4 from Verizon Wireless - which is the first carrier to offer the smartphone. The Moto E4 is sold as a Verizon prepaid phone, costs just $69.99, and can be ordered via the source link below. Announced earlier this month alongside the Moto E4 Plus, the Moto E4 is an entry-level handset that's powered by a quad-core Snapdragon 425 processor and sports a 5-inch display with 720 x 1280 pixels. The new smartphone runs Android 7.1.1 Nougat, offering 2 GB of RAM, 16 GB of expandable storage space, and a 2800 mAh battery. Other features include LTE, a splash-resistant coating, and two cameras (8 MP on the back, 5 MP on the front) with LED flashes. Mind you, this is Verizon's cheapest device to run Android Nougat out of the box. Verizon is selling only a black version of the Moto E4, despite the fact that we've also seen a gold model. Anyway, later this summer, the E4 will be available unlocked (via Motorola and major retailers), as well as through Sprint, Boost, and other smaller networks.